As the weather changes, falling leaves pile up. More often than not, they remain in the gutters of your Alabama home as the days turn colder and winter sets in. It’s football season after all! Who wants to bother with gutter cleaning when there’s a game to watch every Saturday afternoon? But your gutters will freeze a few times before the Spring. If you’ve not taken action before a hard freeze, eventually your gutters might pull away from the house. So then AFTER the damage is evident, you realize you’ve neglected your gutters. 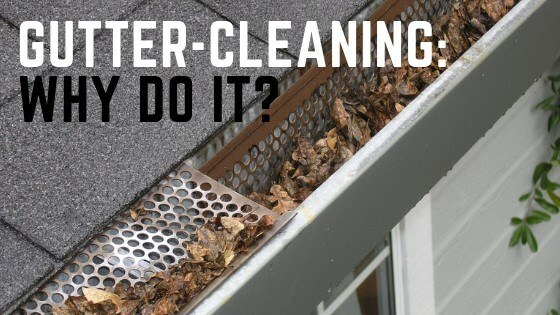 Most people believe that gutter cleaning is an unimportant task, but you need to know that the siding, the foundation, and even your beautiful landscaping can be harmed by neglected gutters. And if you don’t want to face costly and unnecessary repairs, then gutter cleaning should be part of your fall home maintenance schedule. Gutters may seem to be an unimportant part of your home. But they do play a great role in keeping your house in tip-top shape. Gutters prevent rainwater from collecting on your roof, alongside the house, and at your home’s foundation. They’re specifically designed to guide the water away. However, water can’t run through them if they are clogged by leaves and other debris. And this leads to three major problems that can be costly if ignored. Clogged gutters won’t be able to guide water to where it should be, which will then lead to water dripping down the side because it has to go somewhere else. This will then cause the siding to get stained, acquire ice dams during the winter, and possibly rot. Eventually, your roof might also rot which will require you to get expensive repairs. Perfectly working gutters direct water away from your home’s foundation and send it to an area in your yard that can properly absorb it. However, when gutters are not properly maintained, or are broken, water will drip down and will eventually freeze and create cracks that will lead into your basement. This will then lead to mold and rot indoors. Standing water is the favorite home of mosquitoes and other pests. Gutters filled with leaves and debris can hold enough water to attract flies, mosquitoes and other unwanted small visitors in your home. What’s worse is that your family is potentially exposed to mosquito-borne illnesses like West Nile. The good news is that those problems can be very well avoided with proper gutter maintenance. Be sure to clean them out at least once a month in the fall to protect your property and your family. Properly maintaining your home’s gutters is definitely something you should prioritize. If you own rental property though, it’s not always easy to manage gutter cleaning at multiple locations. Reach out to Continental Realty or help with rental property management. We can handle everything from gutter cleaning to major repairs and renovations.